While in the U.S.A.F., Tim Tackett was stationed in Taiwan for almost three years. While there he studied Kuo Shu [Kung-Fu]. His wife was working as a teacher in the Taipei American School during the day and he was working in the evening at the Shu Lin Kuo Air Force Station. Since his days were free he was looking for something to occupy his time. 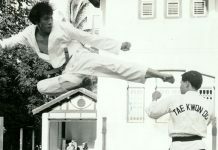 One of his friends recommended that he take up martial arts. He ended up training for six hours a day, six days a week. While in Taiwan he learned two types of Hsing-i, Tai Chi, Northern and Southern Shaolin, White Crane, and Monkey boxing. After his discharge from the air force, he continued to work on his college degree. 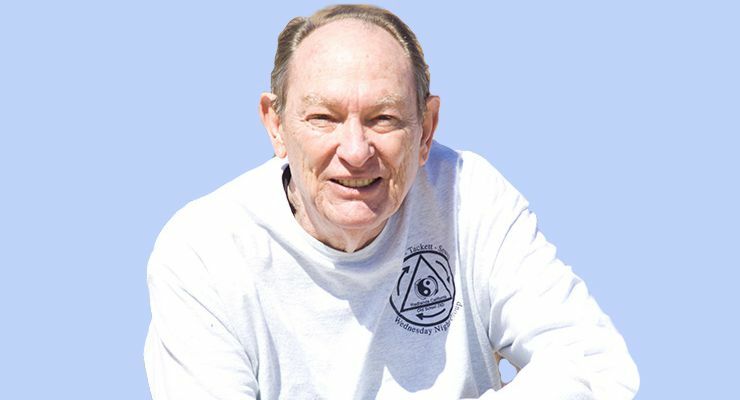 He had a wife and two children to support, so in 1966 he opened up a full time Kung Fu school in Redlands, California while starting as a junior at the University of California, Riverside campus. 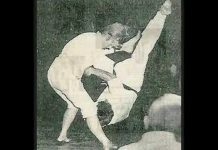 In 1967 Tim Tackett saw Bruce Lee demonstrate Jeet Kune Do at Ed Parker’s tournament in Long Beach, California and he wanted to start studying with Bruce Lee right on the spot, but he soon realized that he would not have enough time until after he graduated from college. 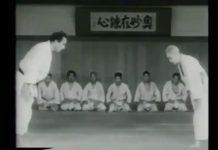 In 1968, Tim Tackett started a Master of Fine Arts program at UCR and no longer had time to teach martial arts full time. 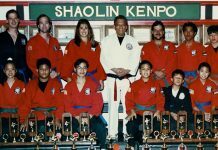 So he closed his school and rented a hall in Redlands two nights a week where he taught what he called Chinese karate as hardly anyone had heard of kung fu let alone Kuo Shu at this time. In 1970 Tim Tackett received his Master of Fine Arts degree and started teaching drama in high school. Soon after his first student, Bob Chapman and he, on the recommendation of Dan Lee, sought out Dan Inosanto. Dan had begun teaching Jeet Kunme Do in his backyard after Bruce Lee had closed his L.A. Chinatown school shortly before moving to Hong Kong to star in The Big Boss (1971). They both felt privileged to be accepted in Dan Inosanto’s backyard class. The class consisted of about 10 students. They got to meet such JKD luminaries as; Bob Bremer, Dan Lee, Richard Bustillo, Jerry Poteet, and Pete Jacobs. Later Chris Kent, Ted LucayLucay, and Jeff Imada joined a second class. After Bruce’s untimely passing, Dan Inosanto and Richard Bustillo opened up the Filipino Kali Academy to promote Filipino martial arts as well as Jeet Kune Do. Since Dan made a promise Bruce not to teach JKD publicly, Dan created a curriculum with four phases of Jun Fan Gung Fu, which is what Bruce called his art before he named it Jeet Kune Do. Dan’s backyard Jeet Kune Do became a closed private class at the Kali Academy. 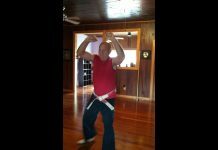 At the same time Tim Tackett was teaching the principles of Jeet Kune Do and using them as tools to examine the martial arts he had learned up until that time. He found that much of what he had been teaching was not very efficient. 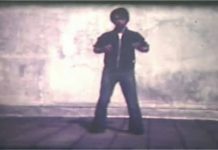 For his own personal experience he kept some hsing-I and all of his tai chi for myself, but he had no desire to teach anything but Jeet Kune Do. Since he didn’t want to teach JKD openly, he closed the school and moved the senior group to his garage where they’ve trained ever since.